The nature of ground preparations is of critical interest to those engaging in the study of historical painting techniques, as certain materials can be identified with specific regions and school of painting. This is the case of a particular ash-based, calcite-rich material obtained as a byproduct of lye production, recently identified for the first time in ground preparations by means of chemical analysis, and which is considered specific to Baroque artists of Spanish school. Because of limitations in the size of the samples that can be removed from works of art, and because of the intrinsic variability of ash composition, chemical analysis alone may not be representative of the whole ash-containing layer, thus limiting the identification of this material. By comparing the morphology, texture and composition of calcite pseudomorphs in laboratory ash to the ground preparations in three Baroque paintings, we provide additional, unequivocal tools to identify calcite particles from ashes in paint cross sections. The results demonstrate that the chemical composition of the ash can vary, but that the morphology and size of the calcite pseudomorph crystals abundantly present in the recycled ash applied to the canvas supports are consistent and extremely characteristic. The unique polygonal shapes and skeletal morphology of the pseudomorphs and their abundance make them ideal markers to recognize ash in paintings’ ground layers, even when very limited amounts of sample are available. The study shows also that the practice of using recycled ash in the preparation of ground layers occurred outside Spain, by artists with direct or indirect Spanish lineage. Plant ash has a long history of applications as raw material in several technological processes, the most well-known being glass production [1, 2]. Adding to this list, there is the recent identification of an ash-based ground layer applied directly to the canvases of several 17th century paintings produced in Madrid, and now in the collection of the Museo Nacional del Prado [3–5]. Jover de Celis and Gayo were the first to describe, through chemical analysis, the use of recycled leached ash in preparatory layers, and provided the first scientific evidence of a practice described in two artist treatises, one by Francisco Pacheco (1564–1644), published in 1649, and the other by Antonio Palomino (1655–1726), published in 1715–25 [6–8]. Historically a variety of inorganic materials bound with natural glues have been used by artists to seal and protect the canvas support prior to the application of upper priming and paint layers containing drying oils. The identification of materials used for the ground structure of paintings is of critical interest to those engaging in the study of historical painting techniques, as certain materials can be identified with specific regions and schools of painting. The ash described by Palomino was referred to as sieved cernada, which is the residual, insoluble fraction of the production of lye, the alkaline solution obtained from plant ash, and used since antiquity as a washing and bleaching agent [5, 9]. Typically, the residual ash was mixed with animal glue, and applied either directly to the canvas or after a thin layer of animal glue. This preparatory layer was known as aparejo or aparejo de ceniza. The chemical composition of ash is known to vary significantly according to several factors, among which are the plant type and what parts are burned, as well as the degree to which the ash is weathered [10, 11]. Considering that only microscopic samples of ground preparations are typically removed from paintings, it is possible that the chemical composition, as determined by the microanalysis of these samples, might not be representative of the whole ash-containing layer and may therefore be insufficient for its unambiguous identification in works of art. In the characterization and identification of ash-based preparatory layers in paintings, the typology of ash particles, particularly those composed of calcite, which generally are present in ground layers, deserves further attention. The abundant particles of micritic calcite with well-defined and recurrent morphologies have been reported to be associated with plant ash in natural, industrial, and archaeological contexts [10, 12, 13]. The documentation of these unique morphological characteristics can be of aid in the unambiguous identification of ash in the ground layers of paintings, particularly when small amounts of sample are available, a well-known limiting factor in the study of the materials in works of art. For this study, the ash-based ground layers of three selected Baroque paintings produced in Italy, Spain and Mexico were examined and analyzed by means of optical and scanning electron microscopy and Raman spectroscopy, and their calcite particles compared to those found in fresh and washed plant ash samples prepared in the laboratory. The aim of our study is to be of further assistance to researches when identifying ash as the source of calcium carbonate by characterizing the unique morphology of ash’s calcite particles. To understand why the morphology and texture of calcite particles can be used as a proxy for the presence of washed ash in grounds, it is necessary to briefly review the composition of fresh ash and its evolution during weathering. Plant ash is a complex assemblage of particles of variable shape, texture, mineralogy, and chemical composition that has been extensively studied because of its technologic and economic role in natural, industrial, and archaeological contests [10, 14, 15]. Plant ash properties vary widely depending on the plant species, age, and wood parts, e.g. stem, bark, branches or twigs , as well as on the combustion temperature and the typology of soil where the plant grew [16, 17]. The mineralogical and chemical properties of ash are also affected by aging and weathering [10, 18], mostly by the interaction with water and the environment in general. Despite this complexity, some characteristics are common to the majority of plant ash, and recurrent in various natural and anthropogenic environments. From a chemical point of view, plant ash is generally dominated by the presence of Ca, K, Mg, with minor amounts of Si, Mn, Al, Fe, P, S, Cl, and Zn [13, 18]. Fresh bark, branches, and twigs generally contain larger amounts of Ca, Mg, Al, K, Na and Si than other plant parts, and produce a higher ash yield [11, 18]. These cations are absorbed, transported and utilized by the plants for their metabolism and growth, with some of them, such as Ca and Si, more easily accumulated as crystallites. From a mineralogical point of view, fresh ash is mainly composed of carbonates, oxides, and chlorides of Ca, Mg and K in different proportions . Fairchildite (K2Ca(CO3)2), calcite (CaCO3), lime (CaO), and periclase (MgO) have been reported among the main constituents of naturally and laboratory produced ashes. Several other minor phases, mostly soluble salts of Mg and K, as well as silica, are present as well . In the presence of a high alkali content, and at relatively high temperatures, glassy vesicular particles can also form . The abundant calcite found in plant ashes mostly derives from the initial thermal decomposition of the intra- and extracellular calcium oxalates whewellite and weddellite that occur in most organs and tissues of plants [18, 19]. Calcium carbonate is found originally in cell walls and as cellular mineral as well, although in smaller amounts than the oxalates . The calcium oxalates have recurrent shapes, the most common being equant to short prismatic crystals, round polycrystalline druses, elongated fibrous crystals known as raphides and styloids, and aggregates of submicrometric crystallites, called crystal sand [10, 19]. With increasing weathering, which starts early on with the interaction of the ash with moisture in air, the mineralogy evolves towards an assemblage dominated by calcite, magnesian calcite ((Ca,Mg)CO3), magnesite (MgCO3), and other hydrated carbonates of Mg . The residual ash used for the ground layers in paintings, such as those described by Francisco Pacheco and Antonio Palomino [5–8], can be considered as an extremely weathered natural ash, whose chemistry and mineralogy reflects the several processes involved in its production. Such recycled material, as found in the sized canvases of paintings, has been reported as being mostly composed of calcite, with other minor components, and an elemental composition that includes Na, Mg, Si, P, S, Cl, K, Ca and Fe in variable proportions . Ashes were prepared in the laboratory by combusting in open-air a mixture of wood pieces, including stems, bark, branches and twigs of various North American hardwood species, including maple, oak and ash tree. The final product was a fine, poorly sorted, white to gray ash that included large fragments of black charcoal. The ash was stored unsealed in open air until it was washed in deionized water. No attempt was made to closely replicate cernada, the residual insoluble fraction formed in the production of lye used to wash clothing, as described in the 17–18th century historic treatises. Details of such procedure are presented by Celis and Gayo . Similarly, no attempt was made to select specific plant species, or to strictly control the combustion temperature and atmosphere, as no assumptions can be made about the origin and treatment of ash used in 17th century paintings. As the focus of this study was the morphological characterization of calcite pseudomorph particles, the ash was first sieved to 2 mm, then washed several times with deionized water until the pH of the dispersion dropped from 9.5 to 10 to around 6 to 6.5. Each time, water was added to the ash in glass beakers, stirred, and then let it fully settle before centrifugation. After washing and centrifugation, the dried ash cakes were gently crushed and sieved to 125 µm. A fraction of the unwashed ash was also sieved to 125 µm. Preliminary powder X-ray diffraction analysis of the fresh laboratory ash identified the presence of calcite, magnesian calcite, lime, periclase and fairchildite, while some minor peaks remained unmatched. Washed laboratory ash almost entirely consists of calcite, with traces of magnesian calcite, lime and periclase (see Additional file 1). Unwashed and washed ash samples were mounted on carbon stubs and coated with 10 nm of carbon prior SEM–EDS analysis. Washed ash was also embedded in epoxy resin (Buehler Epothin™), cross sectioned, and polished mechanically using Micromesh® cloths. Before SEM–EDS analysis, the cross sections were ion milled with a Hitachi IM4000 ion milling system, and coated in high vacuum with 10 nm of carbon. Samples from two portraits by the Spanish Baroque artist Diego Rodríguez de Silva y Velázquez (1599–1660), Juan de Pareja, (the Metropolitan Museum of Art, 1971.86) and Portrait of a Man (Metropolitan Museum of Art, 89.15.29), and one depicting a New Testament subject by the Mexican Baroque artist Cristóbal de Villalpando (ca. 1649–1714), The Adoration of the Magi belonging to Fordham University, were selected for this study. The three paintings share a common 17th century Spanish painting tradition, but were executed in three different locations, Italy, Spain, and Mexico. Diego Velázquez’s portrait of his enslaved assistant, Juan de Pareja is well documented as having been painted in Rome in 1650. While long considered as having been produced in Spain by the workshop of Velázquez, the Portrait of a Man has recently been securely attributed to the master himself . This portrait is a study for one of the bystanders in Velázquez’s Surrender of Breda (ca. 1634–35), and was painted in Madrid between 1630–35. Villalpando’s depiction of the Adoration of the Magi, signed by the artist lower right and dated 1683, was acquired in Mexico during a Jesuit mission and brought to New York in the mid-19th century . Judging from the date and stylistic similarities it was most likely painted when the artist was documented as working in the cathedral in Puebla, Mexico in 1683. Micro-samples were removed from these paintings using a scalpel under high magnification and include the painted surface and most of the preparatory layers down to the canvas supports. These samples were mounted as cross-sections in an acrylic resin (Technovit® 2000 LC) and polished in a similar way as the laboratory ash cross sections. Photomicrographs of the paint cross section samples were taken with a Zeiss light microscope under visible and UV illuminations using the AxioVision4.X.X software. Scanning electron microscopy–energy dispersive X-ray spectrometry analyses (SEM–EDS) were performed with a FE-SEM Zeiss Σigma HD, equipped with an Oxford Instrument X-MaxN 80 SDD detector. Backscattered electron (BSE) images, EDS analysis, and X-ray mapping were carried out with an accelerating voltage of 20 kV in high vacuum. Raman spectroscopy measurements were done on the cross-sections using a Renishaw System 1000 coupled to a Leica DM LM microscope. All the spectra were acquired using a 785 nm laser excitation focused on the sample using a 50× objective lens, with integration times between 10 and 120 s. A 1200 lines/mm grating and a thermoelectrically cooled CCD detector were used. Powers at the sample were set between 0.5 and 5 mW using neutral density filters. XRD analysis was performed using a Philips PW-1835 goniometer and a Philips PW-1830 X-ray diffractometer working with Cu Kα radiation at 40 kV and 30 mA, between 5° and 70° 2θ, a step size of 0.02°, and a scan rate of 1.2°/min. 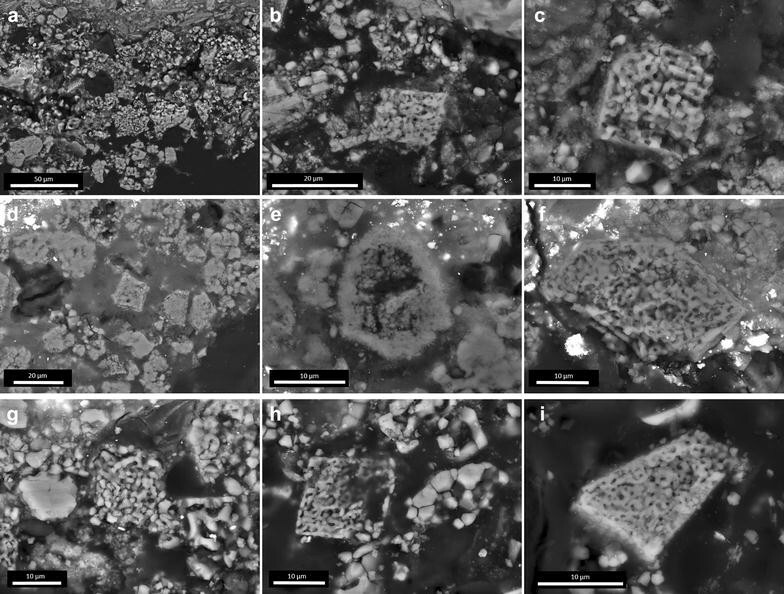 Several studies report images of typical ash particles collected either by optical or scanning electron microscopy [see, for instance, 10–12, 18]. These particles’ shape and size vary, displaying euhedral, anhedral, dendritic, acicular/fibrous, drusy, and vesicular glassy morphologies. Large calcite pseudomorphs after plant fibers and twinned crystals are also present (Fig. 1). The characteristic euhedral, equant and short prismatic pseudomorphs after calcium oxalates range in size from few microns to few tents of microns (Figs. 1, 2, 3). They become the dominant constituents after the ash is washed, as the result of the disappearance of less stable alkaline carbonate and hydroxide particles, the removal of charcoal fragments by floatation and, at least in our case, because of particle-size separation through settling and centrifugation of the water suspension (Fig. 1b). The enrichment in CaCO3 particles is accompanied by a relative increase in the Ca content, from 66.3 to 80.8%, and a decrease in the K content, from 19.0 to 0.7%. The proportions other ions remain approximately constant (Table 1). The morphology of the calcite pseudomorph crystals, in both unwashed and washed ash, is very characteristic (Figs. 2, 3). The various shapes of the single micrometric crystals of calcium oxalates are retained. Replacing the oxalates, there are calcite interlocked rhombohedra, often showing a porous or skeletal structure rich in cavities (Figs. 2, 3, 4). This morphology is the result of a multi-step process that starts with the decomposition of the hydrated calcium oxalates to form calcite and/or lime, depending on the temperature reached during the combustion, with calcite formation and decomposition happening around 425 and 600 °C respectively [22, 23]. The decomposition of oxalates to calcite, and of calcite to lime is accompanied by a reduction in the original oxalate volumes of about 2.4 and 7.9 times, respectively. According to Kloprogge et al. , the pseudomorphic CaO is organized in chains of sub-micrometric particles that follow the original oxalate habit. These small CaO particles are extremely unstable, and can react to form CaCO3 already in the presence of moisture in the environment, before being washed. Full transformation of lime to calcite is expected after long-term weathering or after mixing with water to produce lye. The skeletal morphologies observed in the ash pseudomorphs might indicate that calcite formed by carbonation of CaO particles, as the formation of calcite directly from calcium oxalate occurs without an apparent change in crystal morphology . When observed in cross section, the ash particles display a variety of shapes, both euhedral and anhedral, with skeletal polygonal shapes with four and five sides being the most characteristic (Fig. 4). The porosity of these particles varies widely, and compact varieties are quite scarce. Other shapes include round to sub-round porous particles, particles with pseudo-dendritic outline, and very small single calcite rhombohedra. Most of the calcite pseudomorphs with skeletal texture fall in the range of 10–30 µm (Fig. 4a). Their composition ranges from that of pure calcite to that of magnesian calcite with variable Mg content, up to a maximum measured Mg:Ca atomic ratio of 0.1. Few particles of Ca-rich magnesite were also identified. The three cross sections shown in Fig. 5 display complete stratigraphies, including the lowermost layer in the grounds that were applied right over the canvas supports, but without the fabric itself. The complete cross sections were studied by means of optical and scanning electron microscopy, complemented with Raman spectroscopy. The morphology and texture of the calcite particles were investigated by optical and scanning electron microscopy. The sample from Portrait of a Man consists of four distinct layers (Fig. 5a). The lowermost layer (layer 1 in Fig. 5a) contains mainly calcite particles, together with relatively smaller amounts of apatite, hematite, alkali feldspars, black char particles, and clusters of particles of different size and texture containing Na, Mg, Al, S, P, S, K, and Ca in variable proportions. One particle containing a spinel composed of Fe, Ti, and Mn was also identified in this layer. On top of this layer, a 50 µm thick layer containing a red ochre is present (layer 2 in Fig. 5a), and it is followed by a layer rich in coarse basic lead carbonate (lead white) and smalt particles up to 30 µm in size, with minor amounts of quartz, calcite, apatite, black char, hematite particles, and few large round particles of a red lake on an aluminum substrate (layer 3 in Fig. 5a). At the top of the stratigraphy, there is a relatively thin layer rich in basic lead carbonate, with minor amounts of smalt, quartz, calcite, hematite, and black char particles (layer 4 in Fig. 5a). The sample removed from Juan de Pareja consist of two distinct layers (Fig. 5b). Predominant calcite particles of variable shape and size dispersed in the organic binder are observed at the very bottom of the stratigraphy (layer 1 in Fig. 5b). Few basic lead carbonate and quartz particles are also present in this layer, but these constituents are likely originating in the layer above and are present at the bottom of the sample due to smearing during sample preparation. Above the layer containing the calcite particles, there is a layer composed of abundant, poorly sorted, coarse particles of lead white with sub-round to angular shapes, and poorly sorted, sub-round to round particles of gypsum (layer 2 in Fig. 5b). In this layer, angular quartz particles, black char particles, and scarce apatite, calcite, hematite and vermilion (mercury(II) sulfide) fine particles, as identified by Raman spectroscopy and SEM–EDS analysis, are present in relatively lower amounts. The sample cross section removed from The Adoration of the Magi consists of four distinct layers (Fig. 5c). The lowermost layer contains mainly polygonal calcite particles, a few round apatite grains, and scattered particles of iron oxides and silicates, such as quartz and alkali feldspars (layer 1 in Fig. 5c). Over this layer, there is a 5–7 µm thick layer composed of gypsum (layer 2 in Fig. 5c) followed by a layer containing abundant basic lead carbonate, few, large round calcite particles, scattered purplish particles not yet fully characterized, as well as fine iron oxides, gypsum and silicates particles (layer 3 in Fig. 5c). At the top of the stratigraphy in this cross section, there is a green layer composed of a Cu-based pigment, most likely a verdigris, mixed with lead white (layer 4 in Fig. 5c). All the three samples, despite the variability in the number of layers, have in common the presence of a calcite-rich layer applied directly onto the canvas support in which most of the calcite particles display polygonal shapes with four and five sides, and a clear skeletal texture (Fig. 6). The median size of these particles is comprised between 10 and 30 µm. These characteristics unequivocally identify them as being calcite pseudomorphs after calcium oxalate crystals, such as those shown in in Figs. 2, 3 and 4. 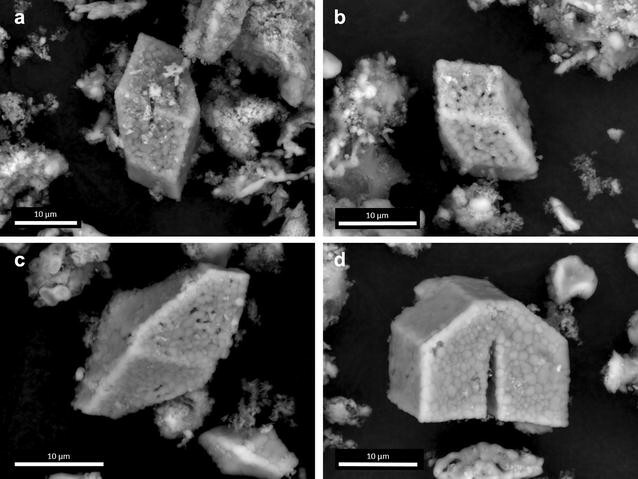 These particles are easily distinguishable under SEM, but can also be recognized by optical microscopy when large, well preserved crystals are present, such as in the case of the sample removed from the Adoration of the Magi (Fig. 5c). 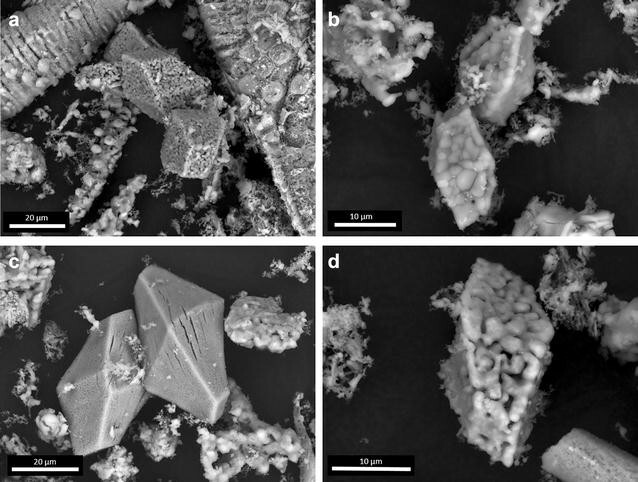 In these three cross sections, there are other less abundant calcite particles: a fraction with sub-round to round shapes and variable porosity; pseudo-dendritic particles with variable shape; and a quite abundant fraction of very fine single particles smaller than 5 µm. Fragmented euhedral crystals result in differently shaped sections that however retain a recognizable porous and/or skeletal texture, such as those in Fig. 6g, h. Non-calcite particles identified are silicates, such as quartz and feldspars, Fe and Fe–Ti–Mn oxides, apatite, black char particles, and undetermined aggregates containing Na, Mg, Al, S, P, S, K, and Ca are present in variable proportions. The presence of variable amounts of particles other than calcite influences the overall chemical composition of these layers (Table 1). The ashes in the ground preparations of the three paintings studied have slightly different chemical compositions, with the amounts of Si, Al, Mg, K, Sr and Fe being the most variable. Conversely, calcite particles have a quite narrow composition that varies from that of pure calcite to magnesian calcite, with a maximum measured Mg:Ca atomic ratio of 0.1 (measured in the ground layer of Portrait of a Man). Traces of Sr have been occasionally observed as well in calcite particles. The study of the materials in paintings is usually accomplished in microsamples mounted as cross sections. The sizes of the samples that may be removed from a work of art without inducing damage and the difficulty of sampling the complete stratigraphies, including all the layers, in the particular case of paintings, are limiting factors in the characterization and identification of the artistic materials, particularly of those closer to the canvas such as the aparejo . If a sample removed is not representative, data on its overall appearance and chemical composition might not be enough to assure a positive identification. It is likely that the sources of the recycled leached ash used in the ground preparations of Baroque paintings were numerous, so it is not possible to propose what plant species and parts were typically used to make the ash that reached the artists’ workshops. However, the compositions may give us some clues. For instance, the use or addition of grass, straw, or cereal ash would lower considerably the Ca/Si ratio, as such products are particularly low in Ca and rich in Si . Higher Si and Al contents may originate in the presence of soil particles carried in some plant parts, particularly roots and bark. Small silicates, such as quartz and feldspars, together with oxides of iron, titanium, and manganese, black char particles, and apatite grains, are among the secondary constituents more frequently observed in the ashes used for the ground layers studied. Silicates and other undetermined particles containing Na, Al, and K, are particularly abundant in the ground layer of Velazquez’s Portrait of a Man, hence its high Si, Al and K contents (Table 1). Conversely, the ash-rich layer in Juan de Pareja appears to be almost pure, and devoid of silicates and carbon particles. Considering the ubiquitous presence of calcite particles in the ash-containing layers studied, it is evident that high-calcium ash was commonly employed. Post processing of the ash, such as washing, sieving, and grinding would also modify its characteristics. Despite the variability that would be introduced by such processes, the great number of calcite pseudomorphs that survive these processes and enter almost unchanged into the mixture applied to size the canvas supports is remarkable (Fig. 1). The chemistry and mineralogy of ash also evolve towards simpler compositions with prolonged interaction with water. The chemical composition of the ash can vary, but the morphology and size of the calcite pseudomorph crystals abundantly present in fresh and weathered plant ash are consistent and extremely characteristic, even when seen in cross sections. Moreover, these particles tend to concentrate as the weathering of ash evolves, and have been reported as the main constituent of both natural ash and of ash prepared in the laboratory. The unique shape and morphology of the pseudomorphs and their abundance in leached ash make them an ideal marker to recognize ash residues in paintings’ ground layers. These particles can be easily identified in sample cross sections by means of optical and electron microscopy. When well preserved, the calcite pseudomorphs have polygonal shapes with four or five sides, and range in size between 10 and 30 µm. Most of the times, the calcite crystals have a skeletal structure with holes and embayments (Figs. 3, 4). This characteristic structure helps in identifying the pseudomorphs when they are broken up and incomplete (Fig. 6). In our study, the calcite pseudomorphs were found to be mostly pure calcium carbonate, although the recurring presence of small amounts of magnesian calcite can be used as a further confirmation of the presence of ash. The morphological characteristics of such micrometric particles, complemented by data on their elemental composition, are the best markers of the use of ashes in the ground layers of paintings. It is of particular interest that the paintings selected for the present study, which all have ash-rich layers applied to the canvas supports, were painted in three different countries. The detection of ash in the ground preparation of Velazquez’s Portrait of a Man adds to the increasing list of Spanish paintings first identified by Jover de Celis and Gayo. The presence of ash in the ground structure of a painting executed by Velázquez while in Rome confirms that this Spanish painter not only maintained his traditional practice, but may also have traveled with his preferred materials. Further investigations of other paintings he executed while abroad would be necessary to increase our understanding of the consistency of this particular aspect of Velazquez’s artistic practice. In addition, it would be of interest to carry out more detailed technical analyses of ground preparations on painting made by artists working in other locations to determine the extent to which recycled ash may, or may not, have been used elsewhere in Europe. Perhaps most remarkable is the first reporting of ash in the preparation of the painting by Cristóbal Villalpando who was born in Mexico in the 17th century and who was trained in the studio of painters who could trace their lineage to Spain. Highly productive artistic practices and well-established workshops had developed in Mexico and other places in New Spain during the 16th and 17th centuries in order to meet the demand of paintings required for ecclesiastical purposes and domestic settings of these thriving and sophisticated societies. This work provides unequivocal tools, complementary to chemical and mineralogical analysis, to recognize a particular ash-based, calcite-rich ground obtained from the byproduct of lye production, identified for the first time in paintings at the Museo Nacional del Prado, which is considered specific to Baroque artists of Spanish school. The morphology and size of the calcite pseudomorph crystals abundantly present in the recycled ash applied to the canvas supports are consistent and extremely characteristic. In cross section, the calcite pseudomorphs have polygonal shapes with four or five sides, and range in size between 10 and 30 µm. These crystals have a characteristic skeletal structure with holes and embayments that helps in identifying them even when they are broken up and incomplete. Calcite crystals with these morphological and textural features are strong markers of the use of ashes in the ground layers of paintings, particularly when very limited amounts of sample are available. Finally, this study suggests that the practice of protecting the canvas support with recycled ash occurred outside Spain as well, but still under the influence of the Spanish school. As an increasing number of paintings produced in Spanish America, Spain and other European countries in the Baroque period are investigated, it is hoped that the findings presented here will bring more understanding to the diffusion in and outside of Spain of the practice of recycling ash for the arts. The work was developed under a larger project on Velazquez, which was conceived by DM and SAC. The SEM–EDS data on the samples removed from the paintings and on the laboratory ashes was acquired by FC. DM prepared the paint cross-sections and provided the art historical perspective. The polarized light microscopy data was acquired by SAC and DM, and Raman data on the paint cross-sections was acquired by SAC. FC drafted the manuscript with inputs from SAC and DM. All authors read and approved the final manuscript. The authors are grateful to Dolores Gayo, Head, and Maite Jover de Celis, Scientist at the Analytical Laboratory, Museo Nacional del Prado, and Javier Portús, Curator of 17th century Spanish Paintings, Museo Nacional del Prado, for helpful discussions that prompted the authors to pursue this project. We wish to thank Ronda Kasl, Curator of Colonial Latin American Art and Keith Christiansen, John Pope-Hennessey Chairman, European Paintings, the Metropolitan Museum of Art for their support and interest, and Joseph Michael McShane, S.J., President of Fordham University, for allowing us to include Cristóbal Villalpando, The Adoration of the Magi, in this study. We also thank Krystal Cunningham, Andrew W. Mellon Fellow in Scientific Research, the Metropolitan Museum of Art, for her help in performing X-ray diffraction analysis. All the data supporting the conclusions are included within the article. Additional SEM and PLM images and detailed EDS analysis are available for consultation upon request in the Scientific Research Department of the Metropolitan Museum of Art. All the research was funded by the Metropolitan Museum of Art. 40494_2018_166_MOESM1_ESM.pdf Additional file 1. Powder X-ray diffraction patterns of fresh (top) and washed (bottom) laboratory ash used in this paper.